We are at week 5 and only one week left until the final reveal of this 6 week One Room Challenge hosted by Linda from Calling It Home and House Beautiful. In case you missed week 1, week 2, week 3 and week 4 posts, click on the links or follow to the previous blog posts at the bottom of this page. As with any design plans, it doesn't always go according to plan. I really didn't like the look of the crawlspace access door and was hoping to cover it up with a dresser and some artwork. I didn't go with the dresser from the moodboard due to costs and went with a plan B dresser that looked pretty good but also was inexpensive. Well, you get what you pay for I guess or it was just meant to be because the dresser arrived damaged. Of course being that this is a 6week challenge, there is no time to get a replacement piece. I got to thinking and came up with an idea of creating a bookcase that is also a secret door! Here's a sneak peak of the current situation. A little more work than putting the dresser together has finally made this One Room Challenge more of a challenge than I had hoped. With limited time to get the correct pieces to build it or even buy a white bookshelf that's the right size, guess what was already sitting in the basement from a previous owner? Talk about serendipity. It actually was the right size and height to fit the opening of the crawl space. I still can't believe it. Below is the photo of the original piece and thanks to my amazing husband it is turning into quiet a lovely secret door. I really love how we are reusing an existing piece, what a great way to turn something old into something new. Right? Here's what it looked like originally. See below on how we are making this happen. 1. Find the right size bookcase. Best scenario is to reuse an old piece. 2. Paint it. For this room, we are painting it white. 3. Find hinges. In my case, we were able to even reuse the existing door hinges from the old cabinet. 4. 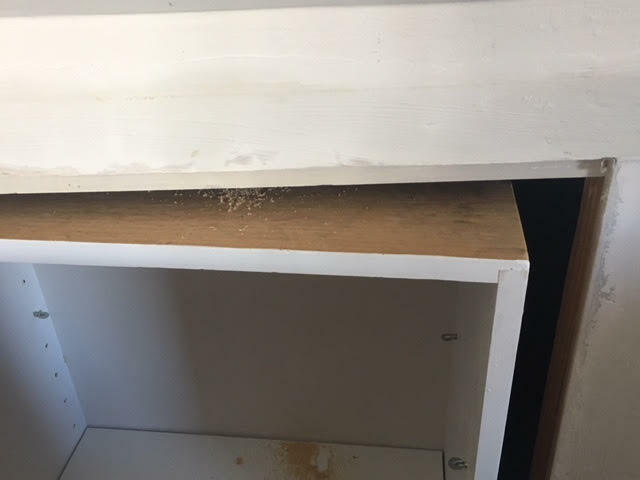 The tricky part is the baseboard heating pipe inside the crawl space that is running on the bottom so the cabinet has to be above it. There are is also the roof rafter which means cuts had to be made in the bookshelf to make sure it fits snuggly and is able to pivot out. 5. Build a frame around it to conceal the opening needed to open the secret door bookshelf and to cover up the bottom where the pipe runs. I have been shopping for bedding and accessories all of this week and I've visited more stores than I can count. I look forward to putting it all together in time for the photoshoot coming up soon. Check out my fellow designers as we all get close to the finish line. Thank you for visiting. Until next week.